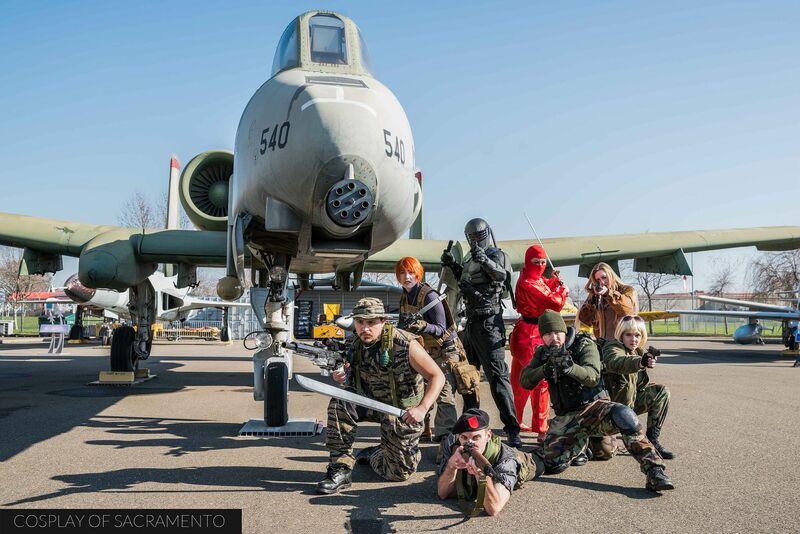 On Saturday I was invited to shoot with the Cobra 1st Legion at the McClellan Air Museum in Sacramento. It's located near where Sac-Con is held, so I was familiar with the area. 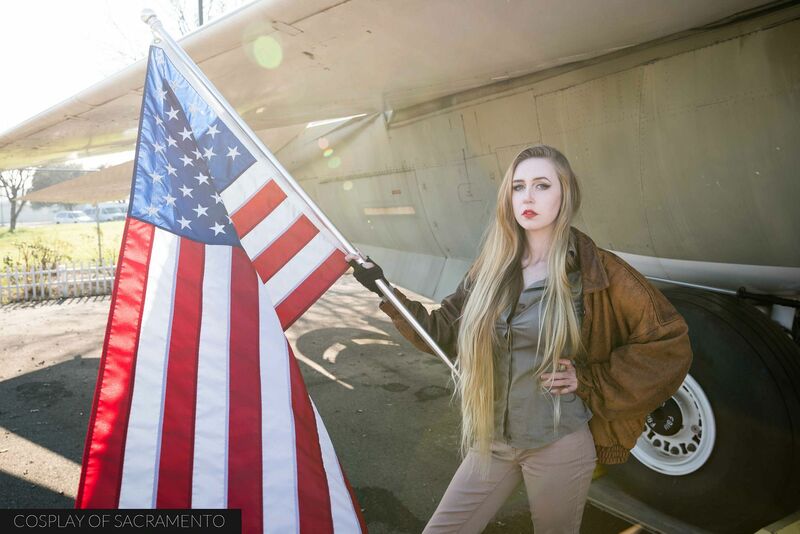 I was excited for this shoot because I knew we'd get the chance to shoot around some awesome aircraft located on site. 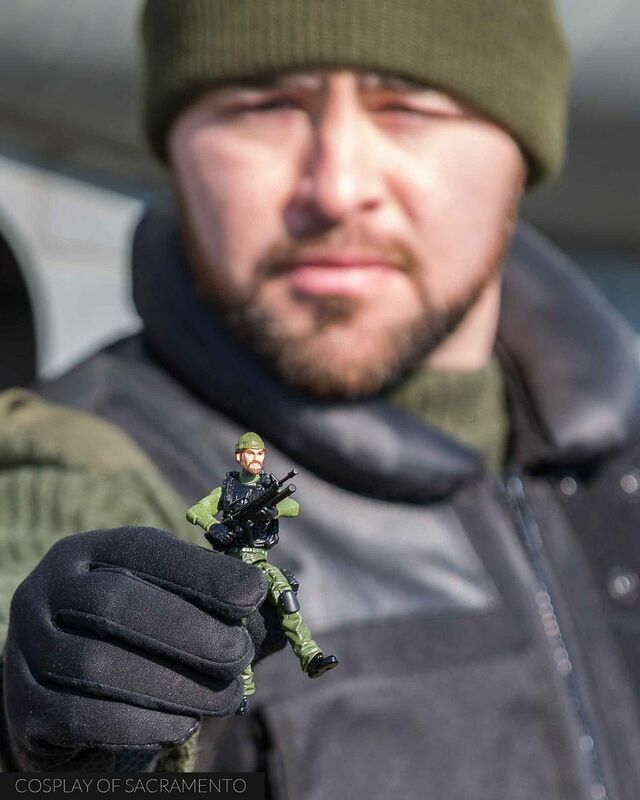 Both GI Joe and Cobra cosplayers turned out for this awesome shoot opportunity. As a kid, GI Joe was my number one favorite cartoon and toy line. It was above Transformers, Thundercats, and all the rest. I had a ton of GI Joe figures that I played with all the time. It was a total obsession for me. It's sad to me that GI Joe isn't as popular as it was in the 80's. There is such a rich history with the franchise and a ton of interesting and unique characters. 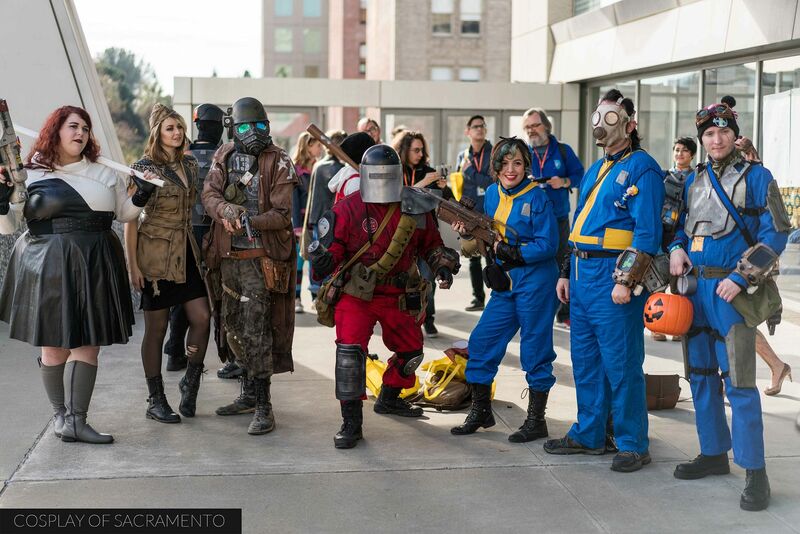 I'm just glad that there is a group here in Sacramento that loves the franchise and cosplays it! 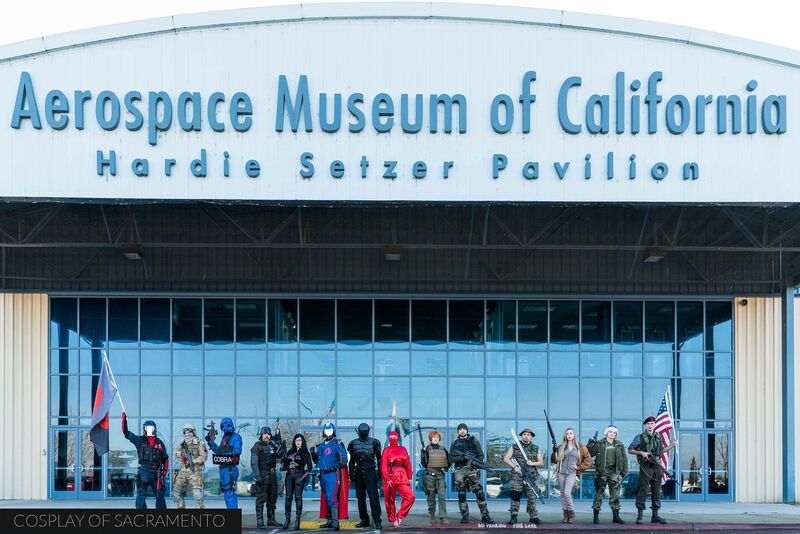 I was impressed with the 'Joe cosplay that came out to the air museum. The attention to detail was really impressive. Both popular characters and lesser known characters were on site. The photo above is of Major Blood. Major Blood was a regular character on the show, but I'm pretty sure not many know of him. 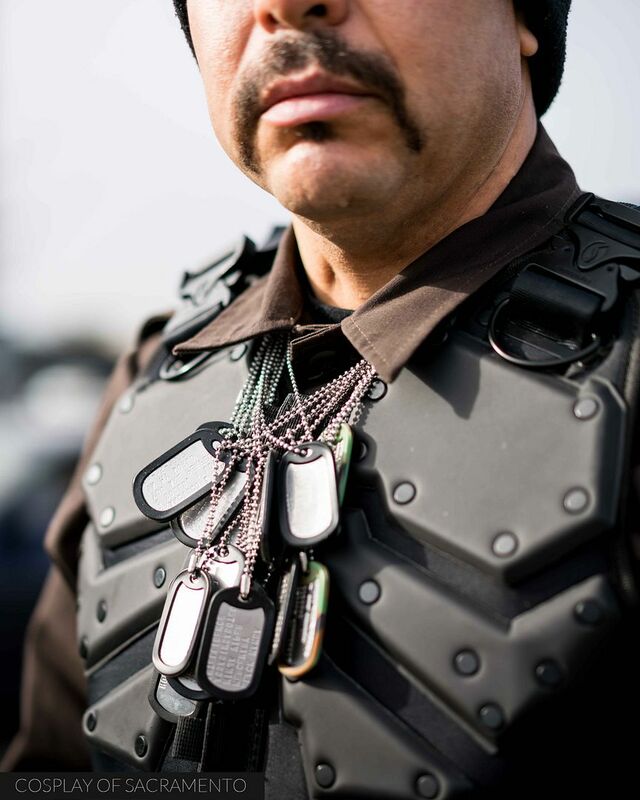 I loved all the dog tags that were worn with the cosplay. It was true to Major Blood's to figuring and was a sweet detail that stood out to me. Cobra always had the really awesome looks to me. They had a futuristic vibe that was very Imperial in nature. I'm sure they'd happily join forces with the Empire from Star Wars given the opportunity. The vast majority of Cobra is made up of soldiers called Vipers. Just like Stormtroopers, there's a Viper for pretty much everything. In the photo above there are two Vipers on the outside with the Baroness, Cobra Commander, and Major Blood in the middle. The 'Joes had an infantry unit soldier, but they the show was really focused on the huge and diverse GI Joe specialists. Many of the Joe team wore green camo, but there were standouts (like the ninjas) that had a completely different look. The 'Joes really remind me of the Rebels in the original Star Wars trilogy. Since I'm a big Star Wars fan as well, it's no wonder I also latched on to GI Joe so much... or was it vice versa!?! What was really cool was when we had the chance to go inside of the planes and check them out. These amazing machines were incredible to be inside, and I relished the opportunity to be inside them. Some of my favorite shots from the photoshoot were the ones taken from the inside of a plane. 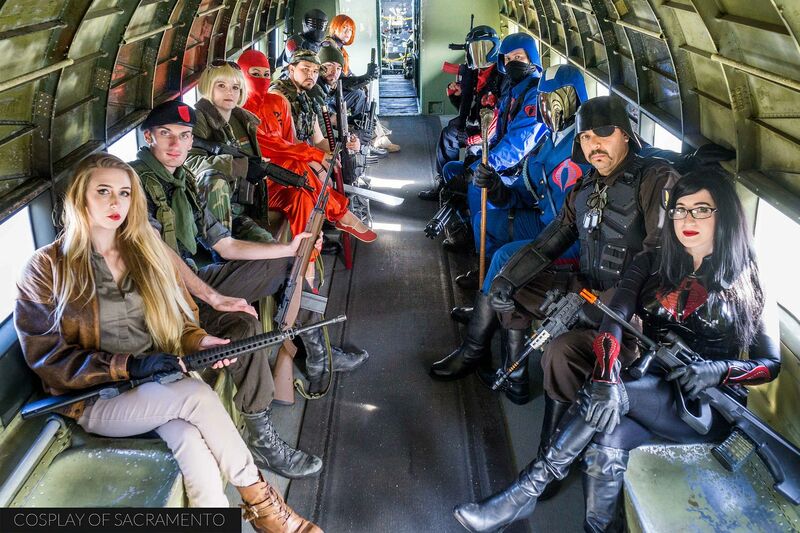 Gotta love how everyone, both Joe and Cobra, are getting alone nicely in this pic. 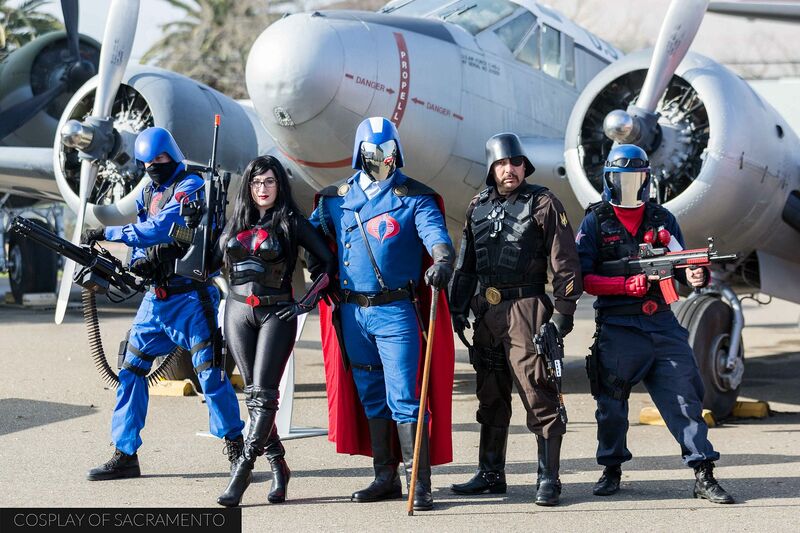 When there's GI Joe cosplay there has to be someone cosplaying the Baroness. OMG. I had a HUGE crush on the Baroness as a kid. It's just something about how bad she was! Oh the memories! 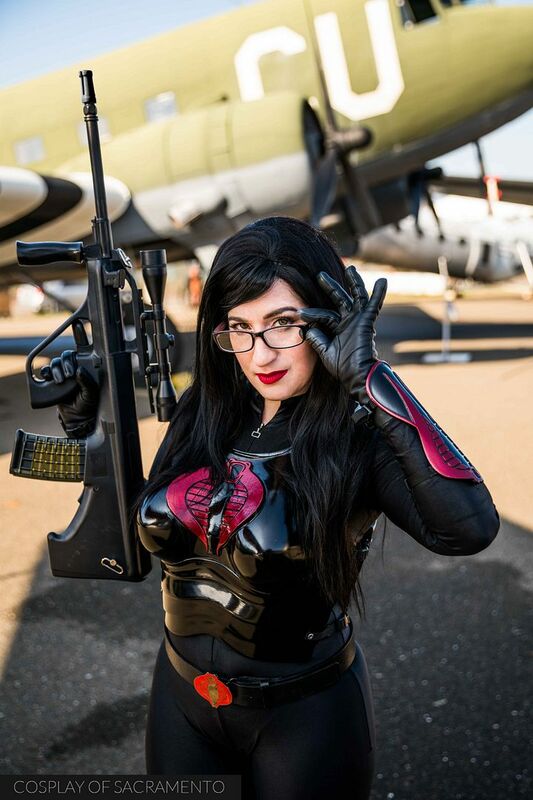 Anyways, I just had to get as many photos of the Baroness that I could during this shoot. The cosplay was truly spectacular, especially the fiberglass chest piece. That thing was legit! All in all I had a huge amount of fun shooting with the Cobra 1st Legion - those peeps are really sweet and I hope to do more photos with them in the near future. A special thanks to Daren (our Cobra Commander today) for inviting me out. It's all about the people you know! And I also want to mention that it was a lot of fun shooting alongside Annette and Perry - both amazing photogs as well. I'm sure you'll see some great photos coming from them really soon. If you'd like to check out my pics from today, CLICK HERE. It's the last day of 2017 Winter SacAnime... and it's been quite the ride! Like this Deadpool cosplayer, I am a bit tired, but still enthusiastic to attend this final day! Of all the days, this was the most rainy and windy yet, but it turned out to be manageable. 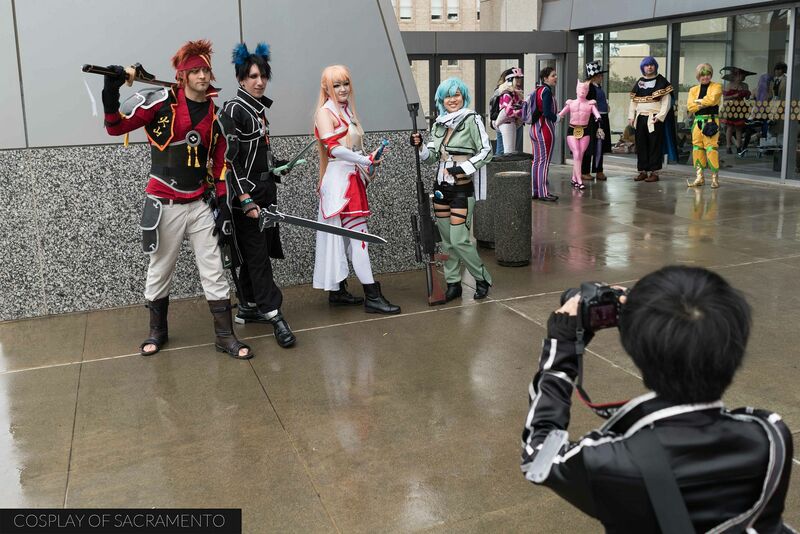 The weather didn't stop anime fans from all over the region in coming out to attend. The convention center was packed full of people wanting to get their anime/fandom fix before the weekend was over. Both fans and stars were busy meeting each other this day. There were still lines to wait in for autographs. Here's a shot of fans waiting to meet Jason Paige, the singer who sang the theme to Pokemon. He was great to everyone he met and didn't hesitate to sing a few bars of the song every so often. 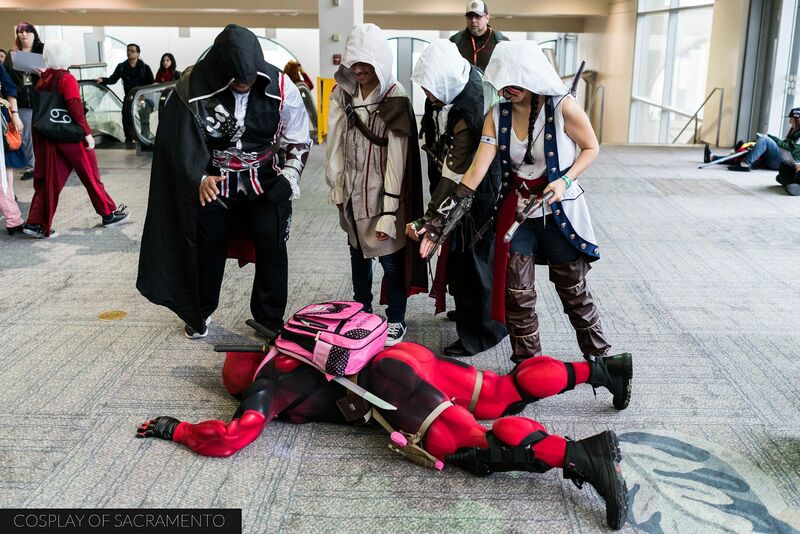 Often times the third day of the convention is the most restrained when it comes to cosplay. Saturday is usually the big cosplay day, but it was awesome to see some save the best for last! Check out this incredible cosplayer! Her tail just went on and on and on. You'll have to watch my day three video at the bottom of this blog post to get a better sense of the amazingness of this cosplay. I arrived late today as I was busy editing photos and video of the second day, so I sadly missed the Star Wars gathering. 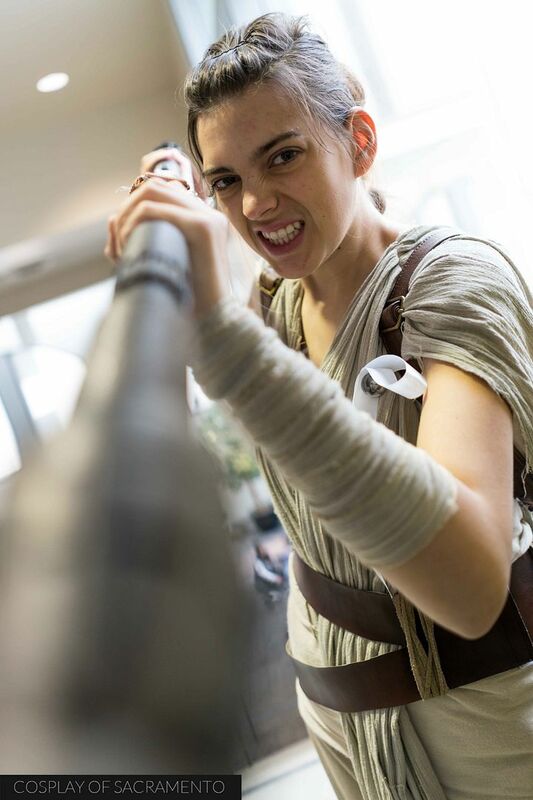 Not all was lost though as I did get a chance to still shoot my friend Cassie in her sweet Rey cosplay. In fact, there were lots of Star Wars cosplay going on today. 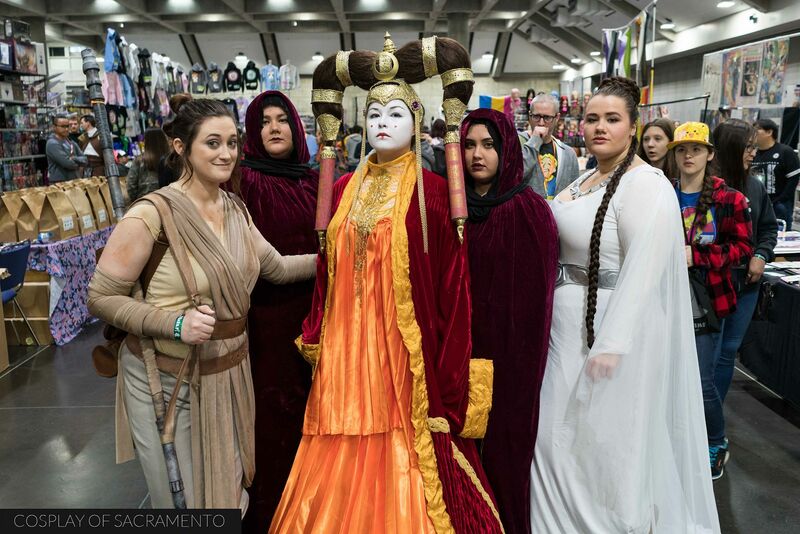 The halls were filled with bounty hunters, space pirates, and lightsaber wielding warriors. So yeah... missed the Star Wars gathering... but didn't miss the Marvel one! 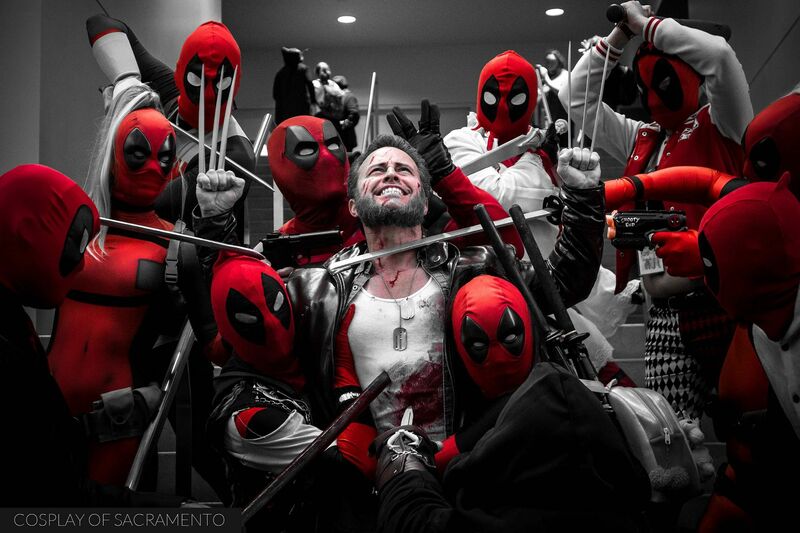 They should have just called it the Deadpool gathering as there were a ton of 'Pools there. I took a lot of photos and probably came away with my favorite pic of the con right here. I love everything that's going on in this photo! Well, that's it! Another SacAnime weekend is done. 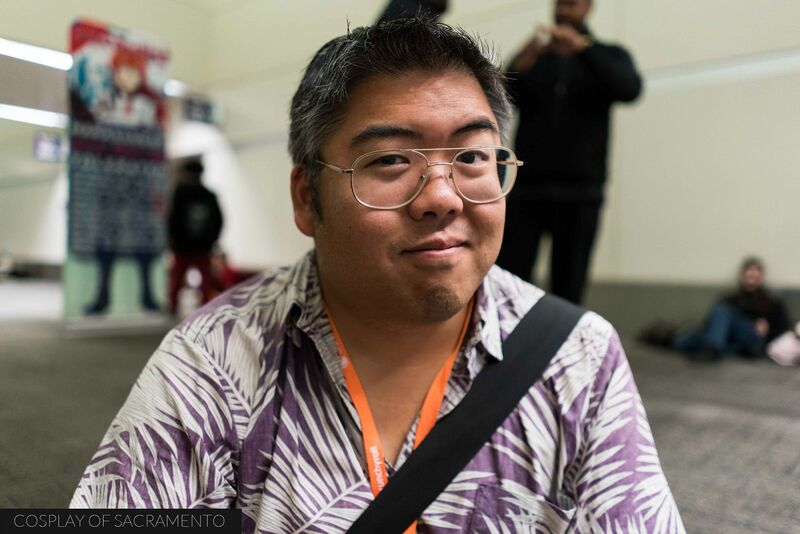 A huge thanks goes out to the organizers of SacAnime, especially Alex! I know there was a ton to do at all times for the staff, but on the show floor and in the panel rooms everything seemed very smooth. I loved checking out all the cosplay and can't wait for the summer edition to roll around! Till then, if you are a cosplayer wanting to get some photos done outside the con, let me know! You'll be featured in a gallery on my main page. Check out a full gallery of photos from day three by CLICKING HERE. Here we go! It's day two of Winter SacAnime! I was afraid that we'd be in the middle of a storm, but apparently the worst of it won't hit until tomorrow. Thankfully those who came out just had to deal with a little wind and some light showers. It wasn't too bad, and it certainly didn't stop all the SacAnimanics from enjoying the con. I was really pleased to see a good turnout and enthusiastic anime fans throughout the day. 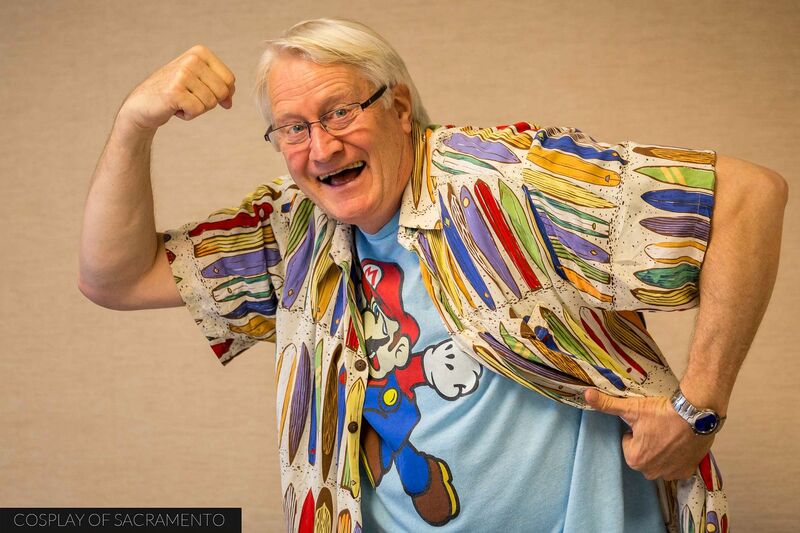 The start of my day was actually sitting in on a special presser with Charles Martinet and Michelle Ruff. 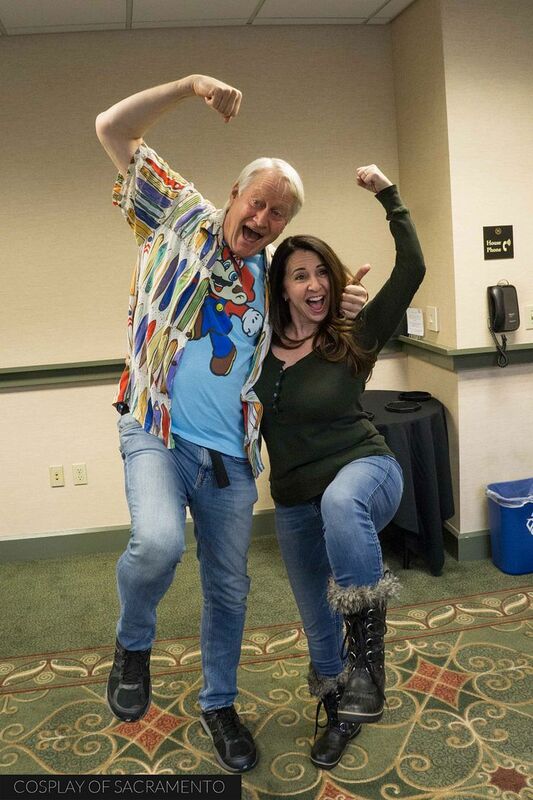 Charles Martinet is the voice of Mario, and Michelle has done many voices for popular animated series. It's actually the first time I've gone to one of these special press events so this was a new experience for me. Both Charles and Michelle were extremely sociable and were a joy to talk with and listen to. It was awesome being able to ask them both questions - just like how you see the press do it on TV! 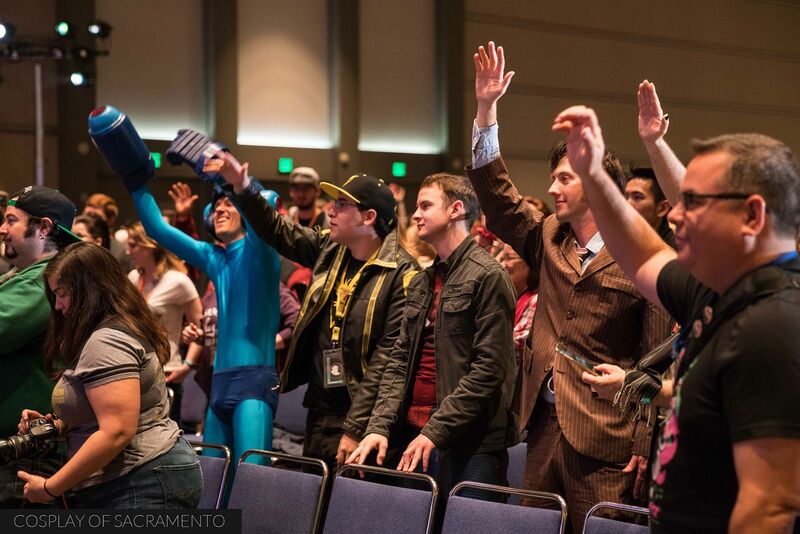 Both Charles and Michelle expressed how much they love coming to Sacramento and SacAnime. I was great to hear the positive experiences they've had in our city and how much they enjoy it. Before they took off for their panels today we got the chance to snap a photo of the both of them doing the Mario pose. Hopefully fans of theirs were able to see them in a panel today or meet them at an autograph session. Both are so friendly and fun to be around. After the presser I went straight to the vendor hall to check out what was going on. It was a lot like yesterday... just multiplied by three or four. The hall was filled with fans visiting dealer booths and purchasing things. Though there were many people in the room, congestion wasn't bad because of the spacing between the rows of tables. 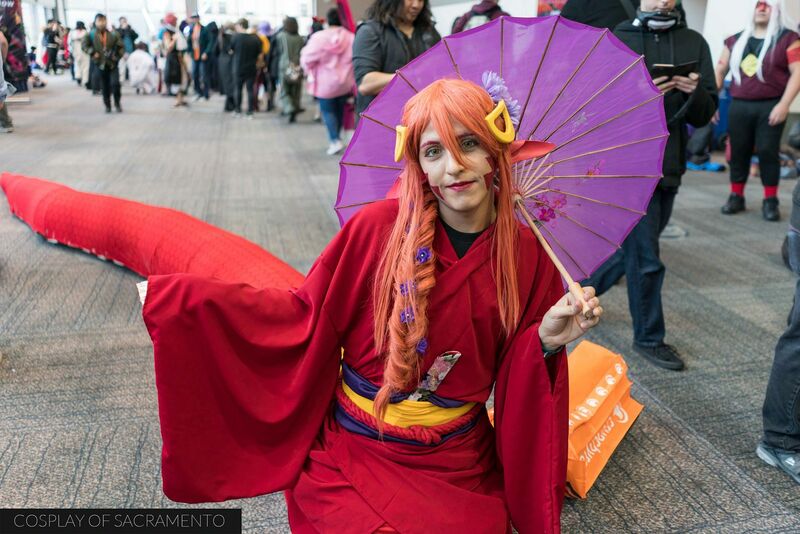 That's one thing I really appreciate at SacAnime! There is always a good amount of space so that you feel comfortable walking around, even for those who have large cosplays on. Props to whoever did the floor plan! It's Steve! OMG! It was so great to see Steve at SacAnime. 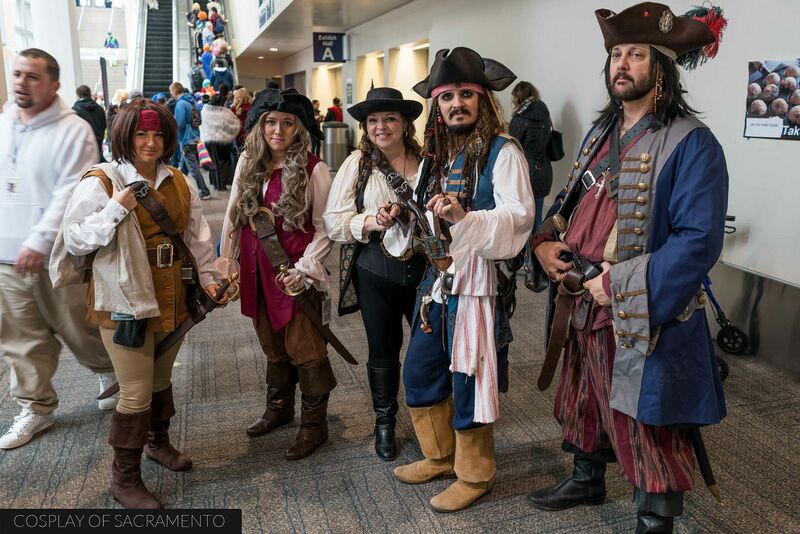 If you don't know, Steve is one of the most beloved cosplayers in Sacramento. He is kind and genuine to everybody. A few months ago he had do undergo a medical procedure and has been recovering ever since. I was really overjoyed to see him back at the con looking like the spitting image of Jack Sparrow. Steve, if you're reading this, I want you to know how happy it made me to see you! Keep getting better! It was time to head upstairs and see what was going on in the upper level of the convention center. Because of the rain, most of the the con goers were inside, but a few braved the wet rain and did some shoots on the terrace. Just 24 hours ago this was the perfect place to get photos done. Ahhh, how the weather can change in just one day! Cosplay meet-ups that were to take place on the terrace were moved to inside locations. Many of the photographers who usually set up shop out here had some time to take pictures with their lighting equipment indoors until the room got too packed. With all the people around, it is easy for an intricate or delicate cosplay to get bumped and damaged. Thankfully there was a cosplay ER on site to help fix any issue that was going on with costumes. 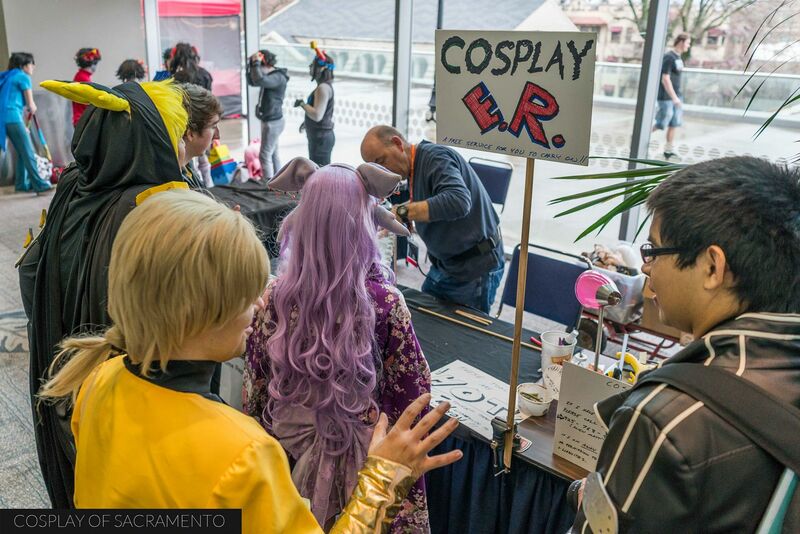 I saw quite a few people take advantage of the cosplay ER's services during the day. I'm sure were able to make things right for many people who had some issue with cosplay. Big thanks to the folks here at this table! They totally saved the day! One of the big events I was looking forward to today was the Geek Fashion Show. I try to catch it whenever it is held during a convention. 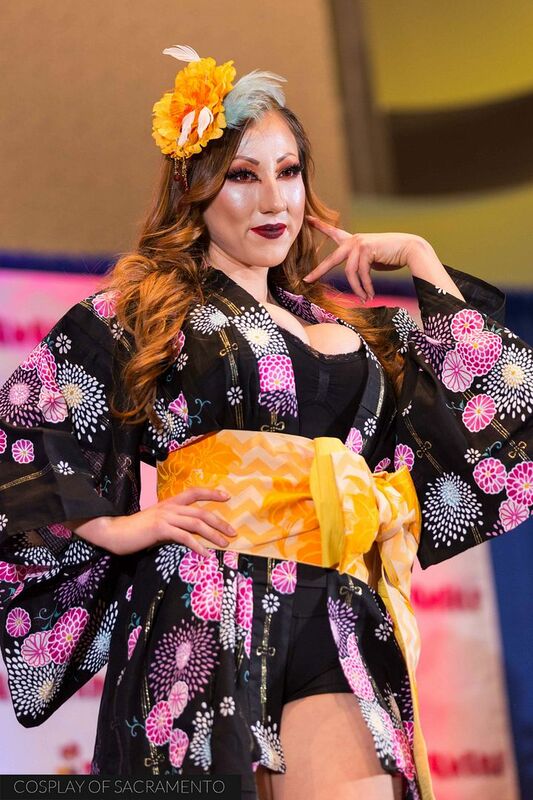 The Geek Fashion Show is a ton of fun and features amazing geek-centric styles from creative designers. The show began with some great music to hype up the audience. Unexpectedly, however, the show was put on pause by the fire alarm going off just as the models were about to take the stage. After a brief exit to the outside of the convention center, everything reset and the Geek Fashion Show was able to go on smoothly. I had a blast taking photos of all the ladies modeling the different clothing lines. All the girls who took the stage were great. Sometimes unexpected things happen (like that fire alarm), but it doesn't mean things have to turn out badly. The Geek Fashion Show was able to weather an unforeseen hitch and navigate past it with ease. I'd say this year's show turned out wonderfully for the audience in the end. 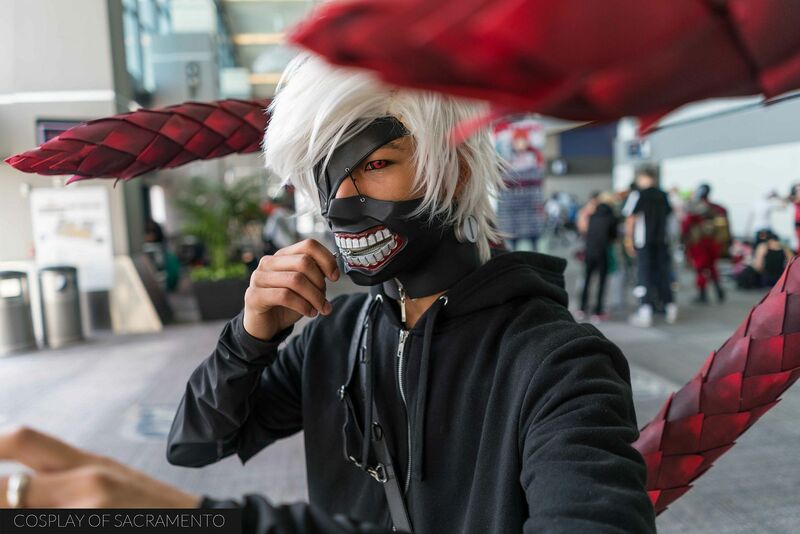 Today was a packed day of shooting photos and seeing all that SacAnime had to offer. I had a blast and enjoyed every minute of my experience. I ended the day in the free autograph hall with Jenn meeting Michelle Ruff. 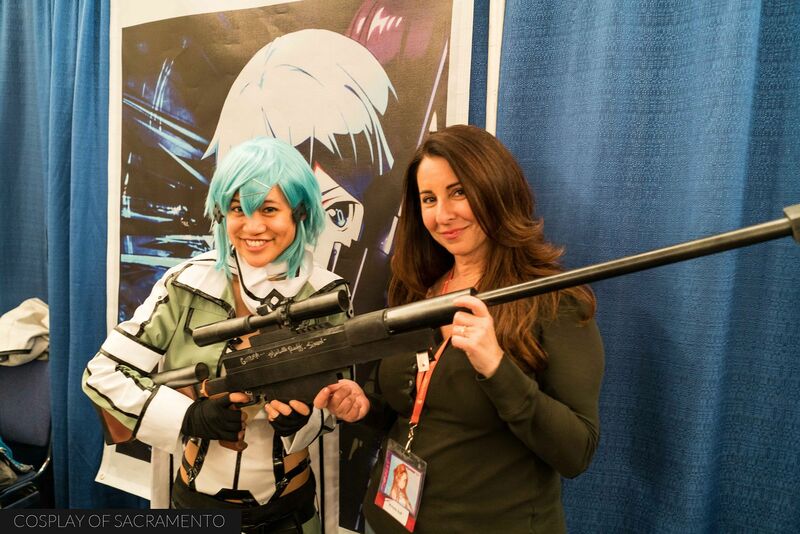 I was telling Michelle about Jenn's Sinon cosplay earlier in the day and she expressed interest in seeing it, so we had to pay her a visit. Michelle loved it and signed Jenn's sniper gun. It was a perfect way to end the day. 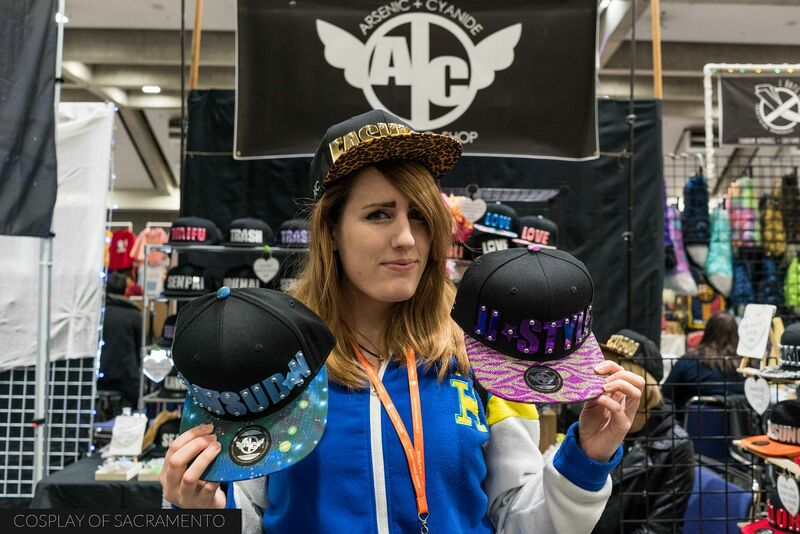 I'll excited to return for the third and final day of SacAnime tomorrow! Wanna see photos from the entire day? CLICK HERE. I've really been looking forward to this SacAnime. 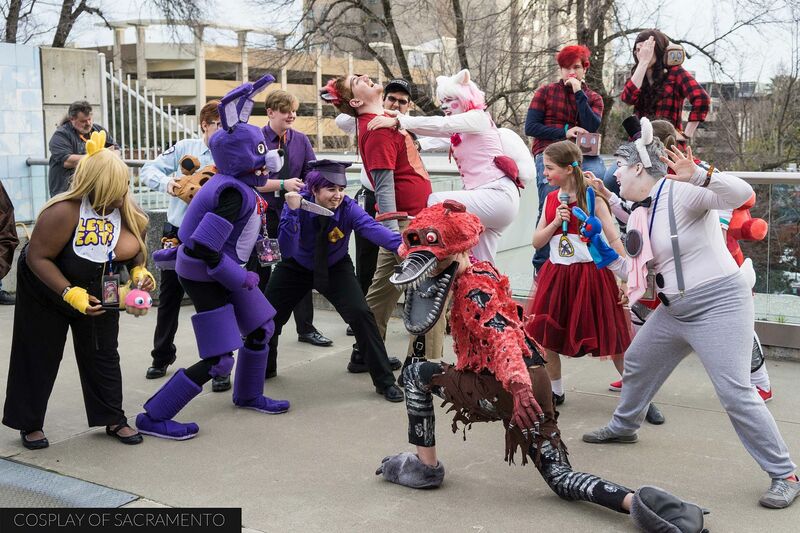 This bi-yearly event is my personal favorite con in the Sacramento area. It draws a ton of people and has a great atmosphere. Today was the first day, so I headed out early to the Sacramento Convention Center with my camera gear in tow and got shooting. Though this was just the first day, there was a ton to see and do already. 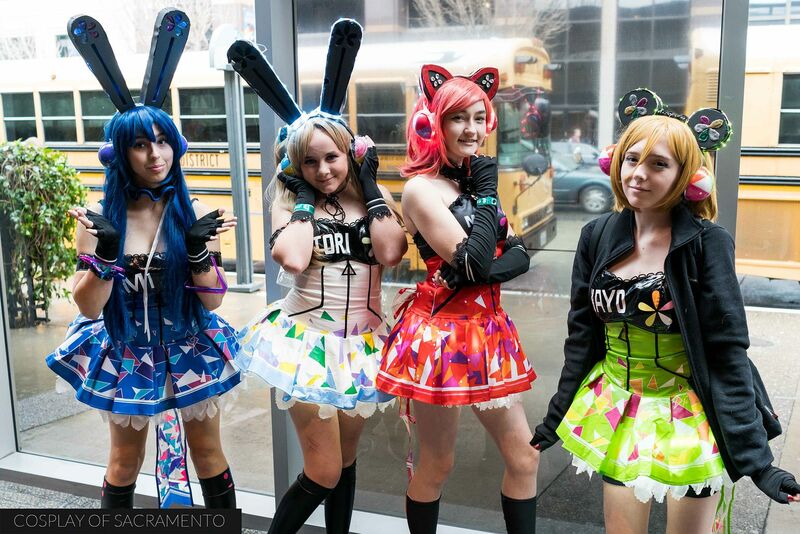 I had a blast checking out all that SacAnime had to offer - from cosplay to panels to gaming. Hopefully you'll get a little taste of the con through the pictures and video that I took. Cosplay was already on point today. Wow. 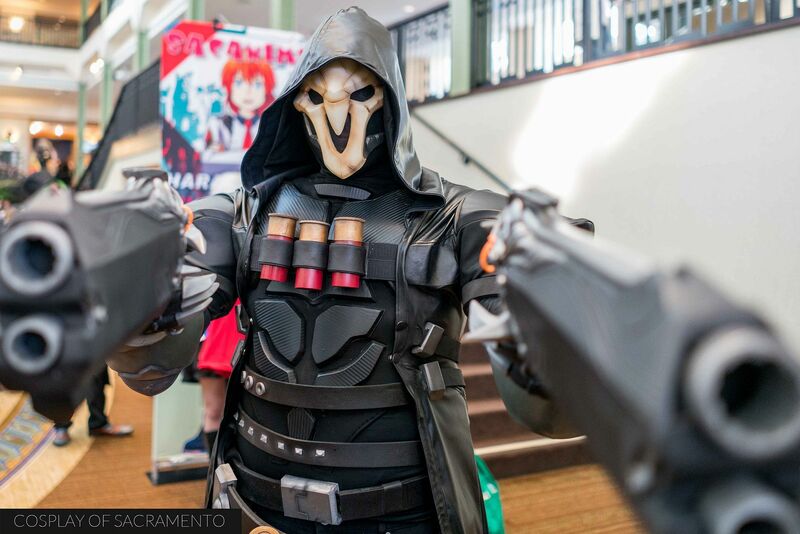 Just check out this amazing Reaper cosplay out of the hit game Overwatch. The cosplay is nicely detailed with bright and striking features. This was one of the very first cosplays I ran into as I got to the con today. What an amazing start to the day cosplay-wise! There were definitely more cosplays on par with this awesome one. You'll have to check out my full gallery at the end of this blog post! As is the norm, the terrace area of the convention center is the place to be for group cosplays. Though a bit cold, the weather was really nice for people to hang out there and get some photos taken. It's supposed to rain for the rest of the con and on into the next week so today might be the only day this area is available. I definitely spent a good amount of time up on the terrace grabbing photos of all the groups that gathered here today. If it does indeed rain for the rest of the con I wonder where the meet-ups will take place. Hopefully there will be an indoor area available. I could really spend the entire day on the upper level of the convention center. Adjacent to the terrace is a large open area that is another great hangout spot for cosplayers. The area is very well lit so it's easy to get some great photos of people walking around and chilling. This area is also the place where you'll often see people dancing and having a lot of fun. The energy in the room has a positive vibe that I think everyone can feel. The main vendor hall is located on the main lower level. It's a giant area with vendors and artists filling up the entire room. I mentioned that I could spend the entire con on the upper level... well... the same can be said of this area as well. Looking around you can see so many items to buy. As a rule, I try not to come here as much just so that my wallet doesn't empty out that quickly. Everything is really tempting! I've definitely done my share of purchasing during past SacAnimes. This year shouldn't be any different. Check out these sweet hats! I know you can't find these locally... probably online... but nothing beats physically picking them up, looking at them, and deciding that they are awesome right then and there. My friend Tina took the opportunity to get some new headgear, and I definitely approve of how great they look. 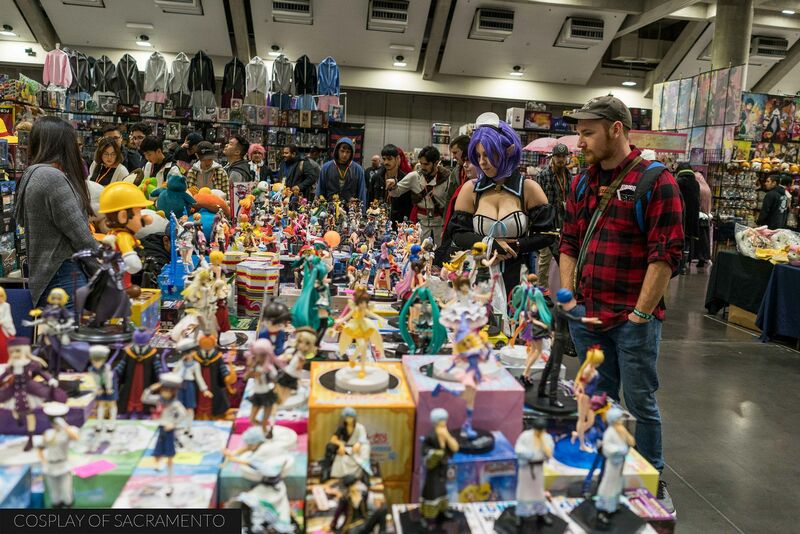 The artist area of SacAnime is just as large as the vendor area. There are so many talented folks that come out to display and sell their work. I'm always in awe of the work that these artists do. It's awesome to see their unique style and take on certain characters. 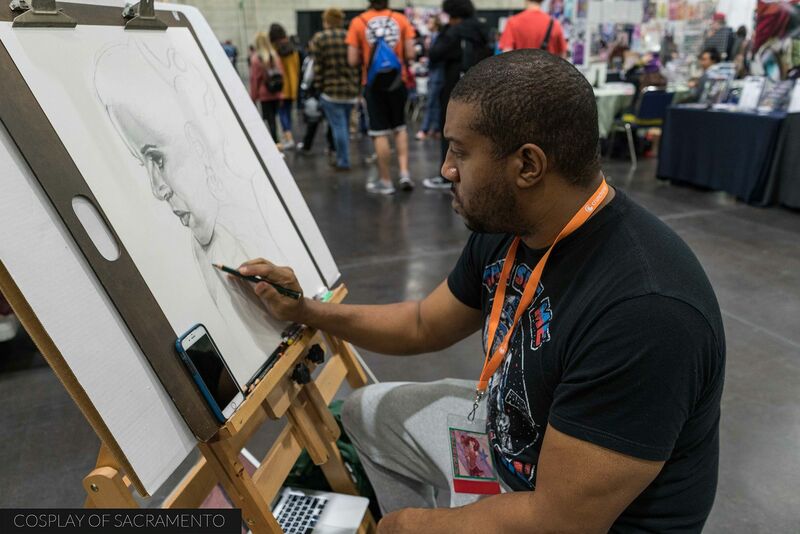 Many of the artists work on their craft at their booth so you can see the art as it is being created. It's awesome to see. If you like what you see I'm sure the artists would love a compliment! One of the great aspects of the Sacramento Convention Center are the really large rooms for panels. 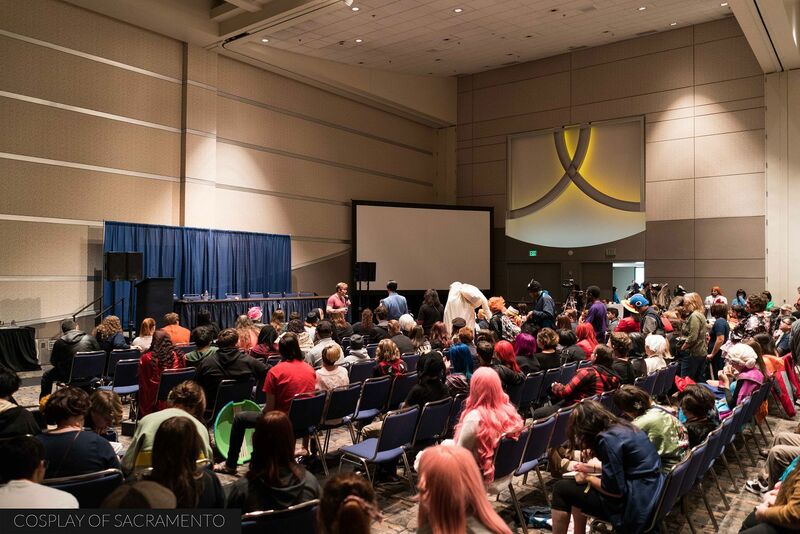 The main rooms can seat hundreds of people, and they will fill up as SacAnime invites some very popular guests to come. 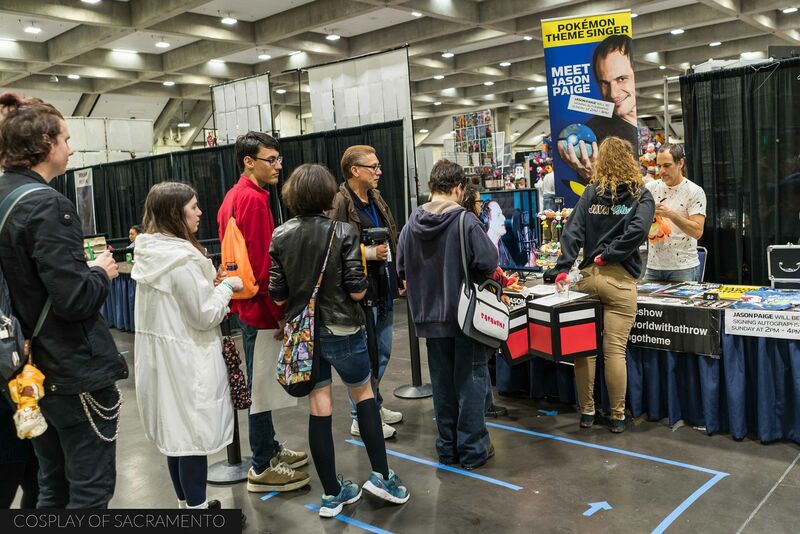 This year SacAnime welcomes many of the Mighty Morphin Power Rangers, voice actor Vic Mignogna, Charles Martinet, and many others. It's a packed schedule that I'm sure will pack these rooms throughout the weekend. 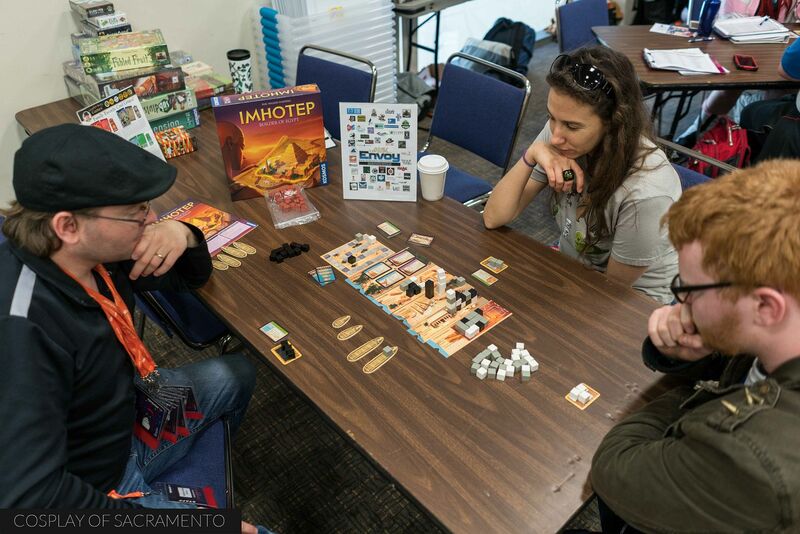 If you're looking for a little break in the action, you may want to stop by the CCG and board game room. There are games for you to check out and play. Table top games have gotten very popular in recent years and there are some amazingly fun games available to play in a group setting. 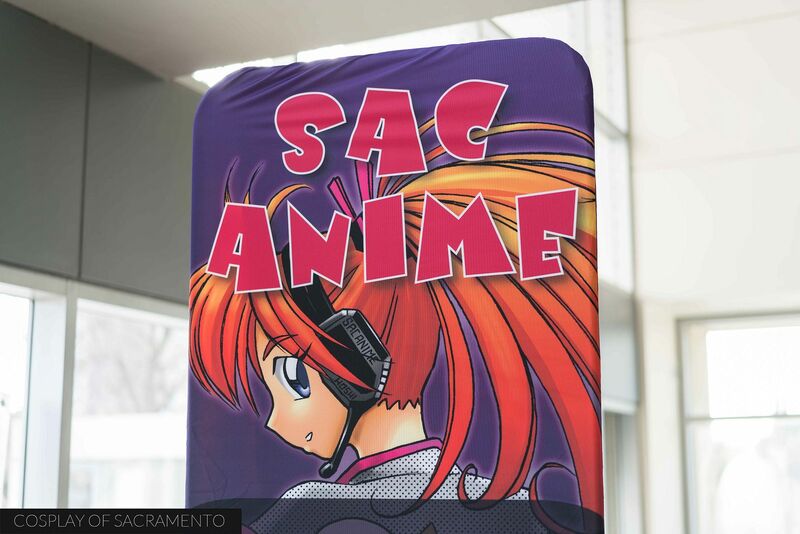 If you're looking to try something new, SacAnime's game rooms just might be the thing you're looking for. Day one was a blast! I'm really looking forward to the rest of the con. I'm crossing my fingers that the weather won't be too bad through the weekend, but you never know! If you'd like to see a full gallery of photos from this first day, CLICK HERE. Look out for blog posts of day two and three coming up. Hope to catch you at the con!